In this Oct. 19, 2015 photo, developer Chuck Williams, a state Republican Party official, looks at the Lake Michigan shoreline through a window in the dilapidated beachfront pavilion at Indiana Dunes State Park in Chesterton, Ind., that he plans to rehabilitate. 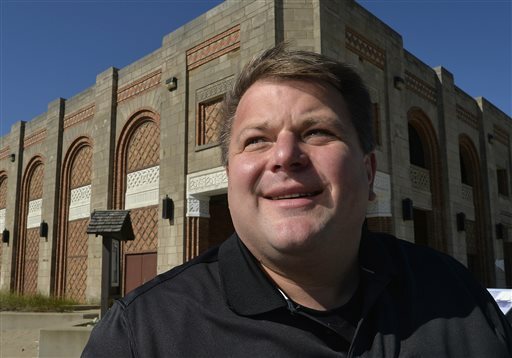 Williams is warning that Indiana could owe him millions of dollars if officials scuttle his contract to bring fine dining, a banquet hall and bar to a lakefront state park surrounded by the state’s towering dunes. From his second floor office, Chuck Williams can see traffic racing by along Lincolnway Avenue near downtown Valparaiso, Indiana. When he walks outside, he steps into what is quintessential small-town America. There are mom-and-pop shops, independent restaurants and the county square just down the street. This is where Williams has built his successful real estate business. But the last few months hasn’t been quite so picturesque for Williams. The project Williams is referring to is his plan to build a banquet facility in the Indiana Dunes State Park in nearby Chesterton. The banquet facility would be built adjacent to the historic -- but long neglected -- beach pavilion. His firm, Pavilion Partners, has an agreement with the Indiana Department of Natural Resources, which controls the Dunes State Park. The 35-year lease allows Williams to serve alcohol at the yet-to-be-built banquet facility and restaurant. But so far, he’s been denied a liquor license by local and state officials. Williams is now appealing the decision by the Indiana Alcohol and Tobacco Commission this month to reject his liquor license application. 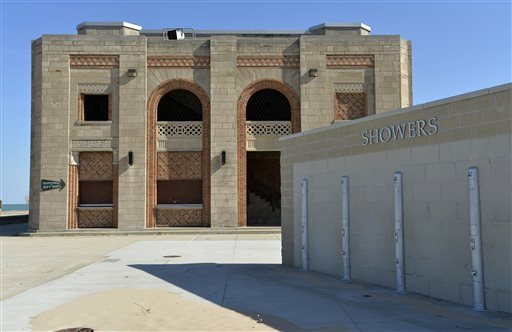 If a license ultimately does not go through, the state could be on the hook to repay Williams about $1.5 million that he says he’s spent to rehab the dilapidated beach pavilion and build new bathroom facilities for the more than one million visitors to the park each year. While he enjoys the backing of local tourism officials for his project, many others in Porter County have voiced loud objections. Williams, described as a political insider who has contributed to Republican causes, says people have been turned against the project because of slanted news reports and outright lies by opponents. Opponents contend his agreement with the Indiana DNR was hatched behind closed doors and in secret. Williams admits he did plant the bug in the ear of DNR officials to consider a restaurant near the dilapidated pavilion back in 2010. But some officials, according to Williams, were apprehensive to the idea since a proposal in 2006 to build a hotel near the beach drew strong objections and was quickly shelved. It took the state nearly two years to move on his idea and seek proposals from developers to build a restaurant. Williams says the process was fair and open to anyone wanting to submit a proposal. While more than a dozen companies sought information from the state on the so-called “RFP,” only one other company besides Pavilion Partners submitted an actual proposal. Williams says his proposal was accepted by the DNR in May of 2012, but it took more than a year for terms to be ironed out. The pushback started in April of this year, when the DNR held meetings in Chesterton to allow the public a chance to comment on a deal that had already been reached. Many in attendance at those meetings say they knew nothing about a proposed banquet facility. Ever since then, opposition has grown and has not quieted down. Acknowledging the state could owe Williams money if the contract is broken, Jim Sweeney, of the conservationist group The Izaak Walton League of America, says he is fine with taxpayer money going to reimburse Williams if it will avoid turning the pavilion into a "three-floor saloon." "He deserves to be paid for what he&apos;s done already, whether we like it or not," Sweeney said. The DNR did not directly respond to questions about whether Williams would be owed money if he can&apos;t get a liquor license. In a statement the agency said the contract does "contain provisions that address each party&apos;s responsibilities, including financial, should the contract be terminated." Williams’ proposed project does have the support of some influential members of the community, such as Speros Batistatos, president and CEO of the South Shore Convention and Visitors Authority. Williams says he had "a vision and a passion" to rehabilitate a building that the state has neglected since he was a child. He says he poured money into a project that the state had refused to fund.That&apos;s despite the state sitting on a $2 billion budget surplus and recently budgeting $24 million to develop new accommodations at Potato Creek State Park near South Bend. "A building, if it&apos;s empty, rots. And this building has been underutilized my entire life," Williams said of the pavilion near the dunes. Besides obtaining approval for a liquor license, the pavilion project still needs to conduct an environmental assessment. When asked if such approvals should have been done before he started any work, Williams said no. Even with opposition right in his own hometown, Williams remains committed to the project. “I think it will be a positive and I’m confident at the end of the day that people are going to enjoy it,” Williams said. Michael Puente is a WBEZ reporter covering politics and regional issues in Northwest Indiana. Follow him @MikePuenteNews.